Do you remember those days before kids? What did you do when you had a migraine or a bout of flu? Did you keep soldiering on like you do now or did you grant yourself permission to relax for an hour, a day, a week? Seems like a luxury now doesn’t it? Homeschooling consumes so much of our waking and even sleeping thoughts. Where is the time for self-care? When and how can you carve out a small portion of your time to check in with yourself when the kids need to finish Lesson 45 of math and Lesson 33 of writing and 3 science labs by this week? If you work from home or run a business while homeschooling, you might be even more stretched. Who has time for pre-reading books or listening to podcasts on education reform when a critical client deadline (income for next month’s groceries) is vying for your attention? However, stepping back, taking a mental-health break, catching 40 winks, being mindful of how you are feeling, thinking positive thoughts…whatever you want to call it, self-care can bring immense benefits to how well you homeschool and how much your children benefit from decisions you might be making on the fly indoors or out regarding their education. Although you might be teaching your kids at home, you don’t have a lot of free time. But there are other ways to be gentle on yourself (and your kids!) without feeling overwhelmed by that lack of elusive hours. As homeschoolers, it is so easy for us to succumb to dark thoughts about how we might be messing up our children’s lives. Mothers, especially, are incredibly sensitive towards characterizing little setbacks as huge failures. One small hiccup often leads to complete curriculum overhaul or feverish worry about how we’re just not qualified to homeschool. We agonize over every single thing we perceive as “going wrong”. Focus instead on what feels right. Being optimistic not only prevents your risk of succumbing to life threatening diseases sooner, but also shows your children how to cope in difficult situations. By role modeling to your children that you are calm but responsive to a setback, you empower them to handle their own setbacks with resilience and equanimity. Teach them what you love. Think about each school day from your own childhood. What were your favorite subjects? What did you do incredibly well? What did you dread? Sometimes, as homeschooling parents, we worry so much about hitting all the subjects every day or fulfilling all the state education standards or guidelines that we forget about learning purely for pleasure. One of our many teach what you love moments involved reading about, and drawing and coloring animals from an animal encyclopedia we loved. I remember the first time I stumbled upon this idea of breaking up monotonous lessons with teaching my kiddo about things I loved, e.g. drawing, animals or the link between literary character analysis and psychology. I understood then why everyone equates epiphany with a lightbulb, a lightning strike, a jolt of current traveling from head to patootie. It’s electric! Sharing my loves with my child was among the most enjoyable moments of our homeschooling. Studies show that when parents show enjoyment towards activities, from sports to the sciences, children often follow suit in loving that activity. Not all of us have caring spouses or even a spouse or life partner in the first place. Not all of us have a large number of family members living nearby who can drop in to care for the kids while we take a much needed nap. And not all of us even want such support if we are extreme introverts. But all of us need support from time to time, even if it’s a short call with a friend or a frustrated rant to our homeschool support group. So build a support routine for yourself. Create a schedule that clearly sets aside at least a 10-minute self care session every day where you either speak to a friend or take a short walk or listen to some uplifting music. Escape to the bathroom if you must to find a peaceful place to do so. When you create your routine, give yourself clear start and end times for intensive one-on-one work with the kids. Then create flex times around activities or classes that require outside time. Give yourself an extra 10-minutes for the commute each way so that you are not rushing to get there. Give yourself a peaceful activity to do like a walk or listening to podcasts while someone else is teaching your kids. The trick is to be consistent and to tell yourself it’s okay if your kids don’t hit every single target you set every day. Learning is organic and will happen no matter what you do or don’t do. Give yourself permission to believe in that. 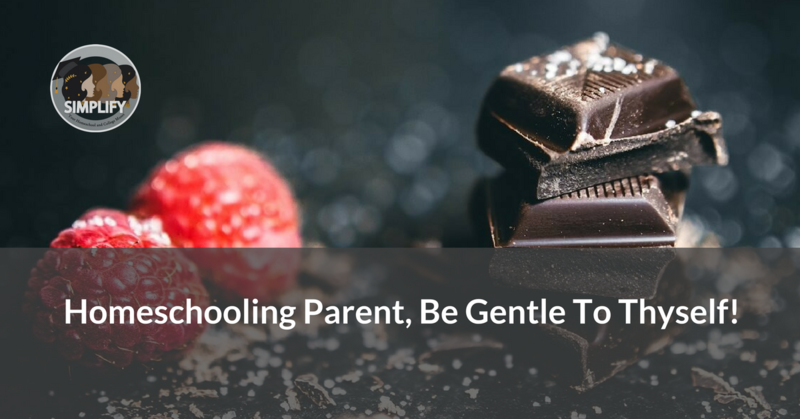 The next time you feel drained or unmotivated to “do school”, or to even carry on homeschooling, turn to your hidden stash of wine and chocolate, then make sure to go over the steps outlined here to keep caring for yourself day in and out. Your Simplify muses are also a great resource to check in with when you have difficult days. Listen to our podcast about Homeschooling When You Have Major Life Issues for more ideas on self-care when things get really hairy.